Obituary for Krystal (Kryss) Powell | Eley Mccrory Funeral Home, Inc.
Krystal F. (Kryss) Powell, 47 of Newell, PA, passed away Sunday, September 16, 2018 at her residence. She was born June 18, 1971 in Gary, IN, daughter of Gerald Powell and Pauline Bartolomucci Powell. 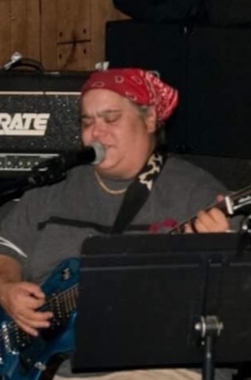 Kryss loved playing the guitar and was a talented musician. She was a huge music fan and her favorite artist was Janice Joplin. Prior to her illness she had worked as a medical assistant. She is survived by her father, Gerald A. Powell of Newell; spouse, Stephanie Trent-Powell; two sisters, Mary Vogel and husband Donald of Newell and Marie Eckert of Lubbock, TX; father & mother-in-law, Lee and Margaret Trent; sister-in-law, Jenny Hoyt; niece Kim Smith; nephew Theodore Vogel & wife Christie, nephew Elijah Hoyt; great niece Mackenzie Smith; cousins, Sandy Fordian, Chelsea Campbell, Frank Bartolomucci, Frankie Bartolomucci,Teresa Bartolomucci; two close friends Keli and Keri Aglio. She also had tons of friends in her life. She was preceded in death by mother, Pauline Bartolomucci Powell. Family and Friends will be received Wednesday, September 19, & Thursday, September 20, 2018 from 2 to 4 and 6 to 8 pm in the Eley-McCrory Funeral Home, Inc., 334 Main Street, Fayette City, PA. www.eleymccroryfuneralhome.com. Blessing service will be held Friday, September 21, 2018 at 9:30 am in the funeral home followed by a funeral mass at 10:00 am in St. Sebastian's Roman Catholic Church, with Rev. Fr. James Bump as celebrant Interment will follow in the Mt. Calvary Cemetery, Coal Center, PA 15423. Members of the St. Sebastian parish will recite the Rosary Thursday at 3 pm in the funeral home.